Not even starting left tackle Nick Gates knew who was going to be the first guy out of the Huskers' backfield when Nebraska opened its season against Arkansas State on Saturday night, not until the video board inside Memorial Stadium flashed sophomore Tre Bryant’s name across the screen shortly before kickoff. Bryant was listed as a co-starter when the team was announced, along with junior Mikale Wilbon, but once the hitting started and Nebraska put the finishing touches on a 43-36 win over the Red Wolves, Bryant had a monster performance next to his name in the box score. The man wide receiver Stanley Morgan Jr. calls an animal carried the ball 31 times Saturday night for 192 yards and a touchdown. The Huskers haven’t had a back break that 30-carry threshold in a season-opener since Marlon Lucky did it against Nevada in 2007. It's also the most rushing yards in a season opener since Lucky's '07 game. And it's just the second time under head coach Mike Riley a running back topped 150 yards on the ground. Riley said the decision to turn Bryant loose was made earlier in the week. But not even Bryant expected such a heavy workload. He said reps were split up in practice and he didn’t know he was even going to be the guy until the first personnel call once the game began. Regardless, once Bryant stepped between the lines, he went to work, aided by a rhythm he was able to find in his new featured role. He ripped off five runs beyond 10 yards. He peeled off a 24-yard carry that, while not his most impressive on the stat sheet, was made possible thanks to four broken tackles and Bryant powering his way through the Arkansas State defense. His long of the night, a 35-yard carry early in the third quarter, saw him past the first line of defense before even feeling a Red Wolves defender. When Bryant cut, he was decisive. There was no dancing around in the backfield and he didn’t try to bounce it outside if he didn’t need to. When he found a hole, he hit it, hard. Bryant’s running had another effect too, one the coaching staff was hoping for throughout fall camp: a perfectly balanced offensive attack. 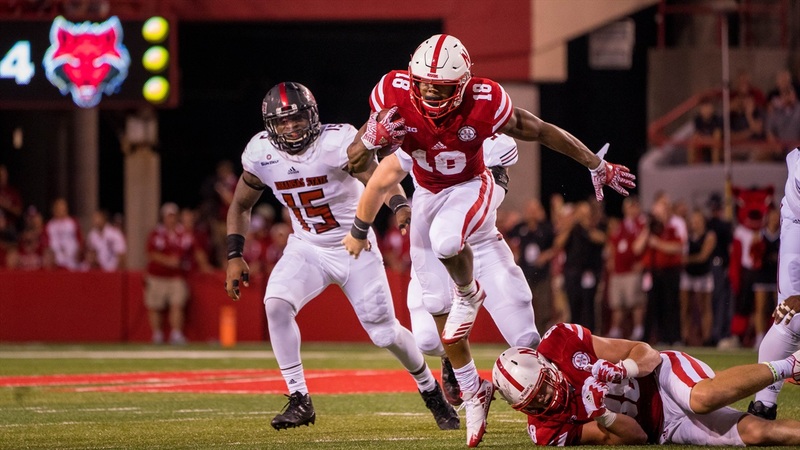 The Huskers finished with 225 yards on the ground and 238 yards in the air. Mike Riley said this performance could be a “snapshot” of who the team wants to be moving forward. Offensive coordinator Danny Langsdorf said there are still a few things to clean up, like backs and tight ends hitting their assignments in pass protection situations, and he was visibly upset with the safety the Huskers gave up in the second quarter. But, as it stands, the Huskers got the win and seemingly confirmed that Bryant is the man in the Nebraska backfield. When the Huskers hit the road to face the Oregon Ducks in Eugene on Sep. 9, Bryant intends to be the leading man again.